Farewell parties are a nice way of sending someone off for a new job, home, school or other circumstance. Games help bring a party alive and get everyone to socialize. These party games are all farewell related and will spark discussion as well as cause laughter. Choose a game or two to help plan an exciting and festive party everyone, especially the honored guest, will remember. 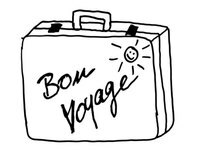 Make a quiz with questions about the honored guest who's leaving. Include some false memories to see who believes they actually happened and marks the answer as true. Use true or false questions, multiple choice and fill-in-the-blank questions. Create a treasure hunt where guests look for clues about the person going away and they all lead to the actual person. Once they find the person they have to hide along with them like the game Sardines. The last person to find the honored guest is the loser. Make the loser do something silly like put on a dunce hat for the remainder of the party. Put a large pile of travel items in the center of the floor along with a couple of suitcases. Have a challenge among a few people at a time to have them see who can pack a suitcase for travel as fast as possible. Choose a specific location where they'll be traveling to and leave it up to the challengers to decide what they should take along. Once everyone has finished, players have to open their suitcase to show everyone what they packed. The rest of the crowd gets to score items. Those they like and find appropriate get one point, and the person with the most points wins. Set up a dinner party where each person is a character in the game Clue. If you have many people you'll need to create more identities. Have this mystery game involve the honored guest going missing instead of being killed as most murder mystery games are played. Guests must try to figure out who kidnapped the honored guest and where the kidnapper took him.